I was sitting in the living room yesterday afternoon, when I noticed the cat was taking particular interest in the tree in front of the house. 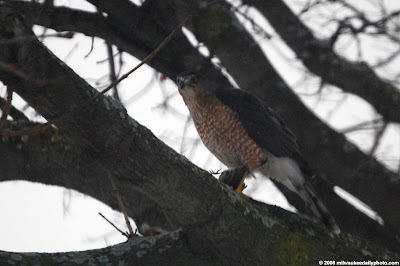 Turns out he was looking at this Peregrine Falcon, which had decided to use the tree as his dining area. The falcon finished his dinner, hung around for a few minutes, and headed off towards the freeway, probably in search of another meal. I know that Peregrines are fairly common, but it still amazes me to see such an amazing bird within the city limits.